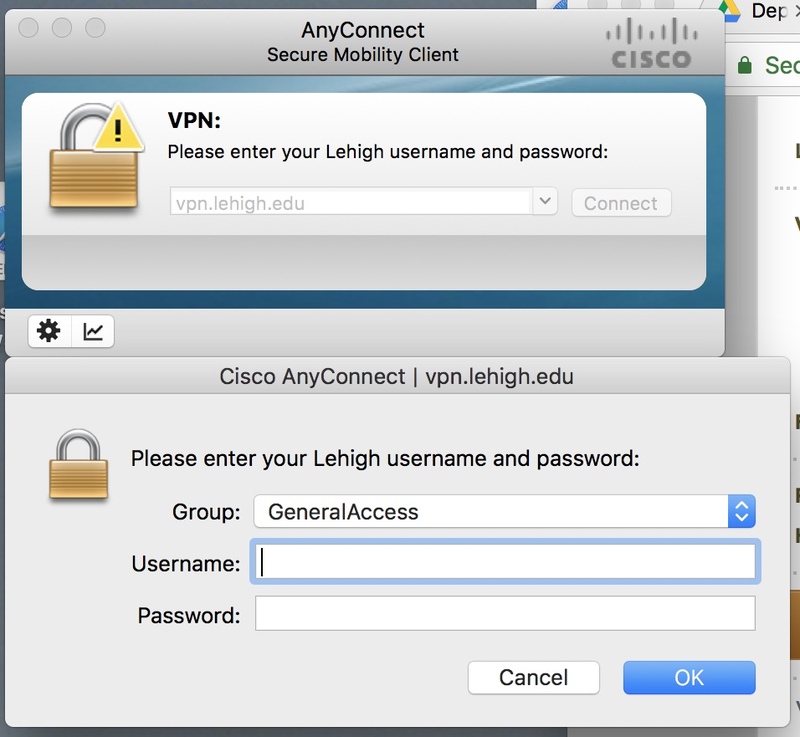 After downloading and installing the Cisco AnyConnect client software for your device, as described on the VPN service page, you'll need to configure it and create a connection in order to begin accessing services that are inside Lehigh's network firewall. Find the 'Cisco AnyConnect' software on your system and start it. You'll see a window with a blank box and a 'Connect' button. Type 'vpn.lehigh.edu' into the box, and click 'Connect'. You'll see another window open containing a pull-down menu and blanks for a username and password. If you're making this connection to access Library Resources, select 'Library Resources' from the pull-down. For all other connections, leave it on the default 'General Access', and type your Lehigh username and password into the appropriate boxes, and click 'OK'. Tech. note: 'General Access' creates a split-tunnel, 'Library Resources' creates a full tunnel. If the connection works properly, you will see the icon for the program change in the menu or taskbar to show a lock. You may then proceed to access the Lehigh network resource as if you were on campus.